“Better Ways of Living and Experiencing Music” – Sanspoint. Though not a requirement, the signs were effective enough that I did see a lot fewer phones and cameras out in the crowd at Terminal 5 than I had at most shows in the last few years. 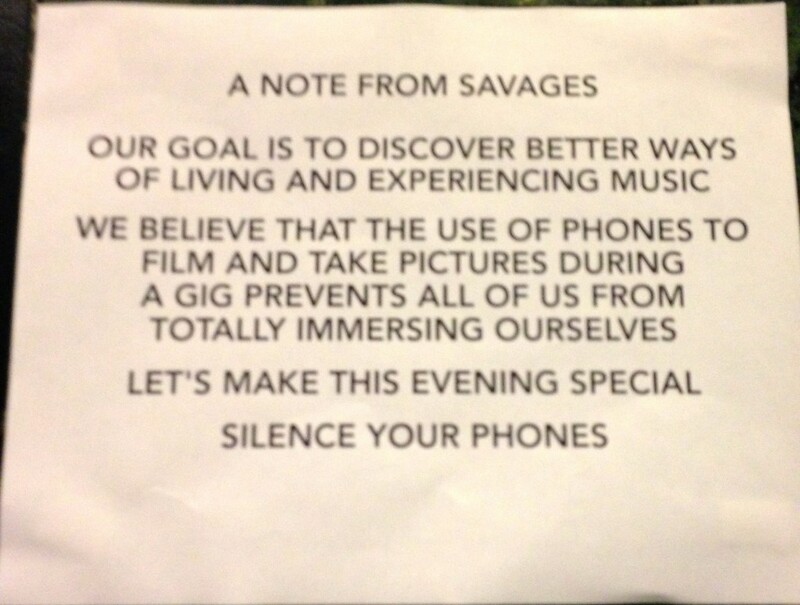 I kept my phone in my pocket for the entirety of Savages extremely intense set, though it took a lot of willpower at times. A couple of weeks later, I was back at Terminal 5 for They Might Be Giants, who had less of an issue with photo takers and phone sharers. They even asked their Twitter followers to post pics of themselves in the crowd, pre-show, and re-tweeted them. (Though they didn’t retweet my picture…) At a previous TMBG show, John Linnell even snatched the camera from an audience member’s hand, recorded himself playing keyboard for a few seconds, and handed it back. It was an interesting comparison. Looking back, I was more involved in the Savages performance, and not just because I got swept up to the barrier by the surging crowd during the song “Husbands”. Not taking and sharing pictures meant that I wasn’t looking down at my phone to see if it came out right, set the right vintage looking image filter, or see if the upload failed due to spotty reception inside the venue. Nothing taking myself away from the show meant I was as present as I could be. Something that I’ve missed out on in the past. People have been taking photos and video at concerts as long as it was possible to bring cameras into venues, whether the venue allowed it or not. It’s just easier to do now. There’s always been a desire to immortalize a temporary experience in something that can last forever: a photo, a video, a souvenir. Those have always been for ourselves, however. Now, when we immortalize something temporary, it’s for the world, or at least all of the people we know. That changes things. The experience is no longer personal. It becomes instant nostalgia, and that’s not a crack on image filters. We become concerned about how our friends (and “friends”) feel about the cool thing we’re doing, and not the actual cool thing we’re doing. That concern is going to take up a part of our attention that can’t pay attention to the actual event unfolding in front of us. Mathematically alone, it diminishes out involvement in what we’re experiencing. We lose something this way. I think at the next show I go to, I’ll take a couple of pictures early in the set, then shove my phone in my pocket until the house lights come back on. Those pictures won’t be shared on any social media service until I’m home, looked them over, and decided if any are worth even keeping, let alone sharing. I’d prefer to be more present for the concerts I attend from here on out—or any other experience I’m having. I don’t know if it’s a better way of living, but being fully there is certainly a better way of experiencing. And it goes way beyond just rock concerts.